Rockwall Metal Roofing offers Quality Roof Repair and Installation Solutions for Apartment Complexes in Rockwall, Mesquite, Garland, Balch Springs, and Rowlett. We fully understand that there are residents occupying many homes within your Apartment Complex and that you are dedicated to their Safety and Comfort. Apartment Complex Roofing Repair and Installation should only be done with the Highest Quality and Professionalism. Rockwall Metal Roof offers both. We begin and complete all of our jobs in a very timely manner, but make this a priority with Multi-family Complexes. Our schedule will become your schedule, working only when you would like us there. All Apartment Roofs vary in regards to the slope and style; and it's very possible that an Apartment Complex could have multiple styles of roofing throughout. Don't let that deter you from calling! We can handle any variation of roofs we are given. We will conduct ourselves in a Courteous and Professional around your residents, while keeping to the time frame laid out. Apartment Roofing Damage can come at anytime, whether it's because of one of our notorious North Texas Hail Storms, age, or wind. We offer Emergency Services for such occasions when a leaky roof is present. Not one of your Residents should have water dripping from their ceiling. 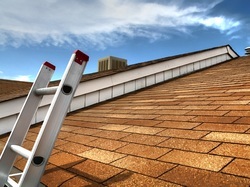 Apartment Roofing Replacement can be scary when you consider the costs. When you talk to one of our Courteous Staff members, they will ﻿walk﻿ you through our Affordable Roofing Plans, helping you choose options that are right for you. We stand to remain competitive in our pricing in the DFW area. This area is saturated with Roofing Companies; we won't fall behind because of price. We will work with your budget. We would love the opportunity to talk with you to discuss how we can partner together in Repairing or Replacing your Apartment Complex Roof.